Purple with character drawing printed in. That’s right, The Pro has a pair for you. Socks that is, geesh. You act like a filthy…..oh wait, that’s right, if you’re a fan of The PRO, then these socks are perfect for you! We’ve created a small run of The Pro socks. These are one size fit all, mid-ankle socks created perfectly for you to display your love for the filthy and lovable character The PRO. 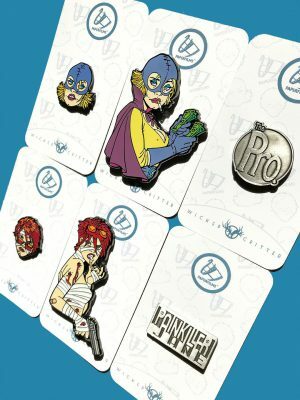 The PRO, created by Amanda Conner, Jimmy Palmiotti and Garth Ennis is heading to the big screen soon and this is a great way to show your support and love and feel cozy at the same time. These are one size fits all socks and available now!